DOUBLE the working life of your Proposition 65 Warning Signs by adding 3M Protective Overlay Film (POF)! 3M’s high-tech POF protects sign faces against fading caused by the sun and harsh weather—and makes graffiti and sticker defacement damage easy to clear away without harsh abrasives. When Vehicle Repair Facilities warnings are provided they must be posted at each service and body shop public entrance, printed in no smaller than 32-point type. 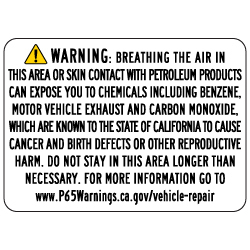 Proposition 65 requires businesses to provide warnings to the public about significant exposures to chemicals that cause cancer, birth defects or other reproductive harm. These chemicals can be in the products that people purchase, in their homes or workplaces, or that are released into the environment. By requiring that this information be provided, Proposition 65 enables the public to make informed decisions about their exposures to these chemicals. Proposition 65 also prohibits businesses from knowingly discharging significant amounts of listed chemicals into sources of drinking water. Proposition 65, officially known as the Safe Drinking Water and Toxic Enforcement Act of 1986, was enacted as a ballot initiative in November 1986. The proposition protects the state's drinking water sources from being contaminated with chemicals known to cause cancer, birth defects or other reproductive harm, and requires businesses to inform Californians about exposures to such chemicals. Proposition 65 requires the state to maintain and update a list of chemicals known to the state to cause cancer or reproductive toxicity.